I've been reading a lot of ongoing series lately which don't lend themselves well to my usual rambling review style. This time I'll take a look at a collection of short stories from the creator of Blade Of The Immortal (Mugen No Juunin). 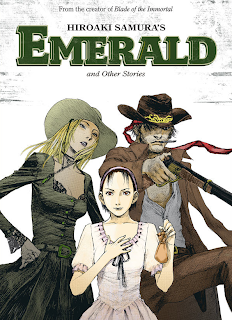 Samura Hiroaki's Emerald And Other Stories was originally released in Japanese as Sister Generator, and from the covers alone it would be difficult for anyone to recognise them as the same book. The English adaptation was published by Dark Horse on 26th February 2013 and should be available through all good online stores. A preview is available on the official website here. The book is made up of six short stories with a handful of standalone illustrations of women in between drawn in Samura's distinctive style. 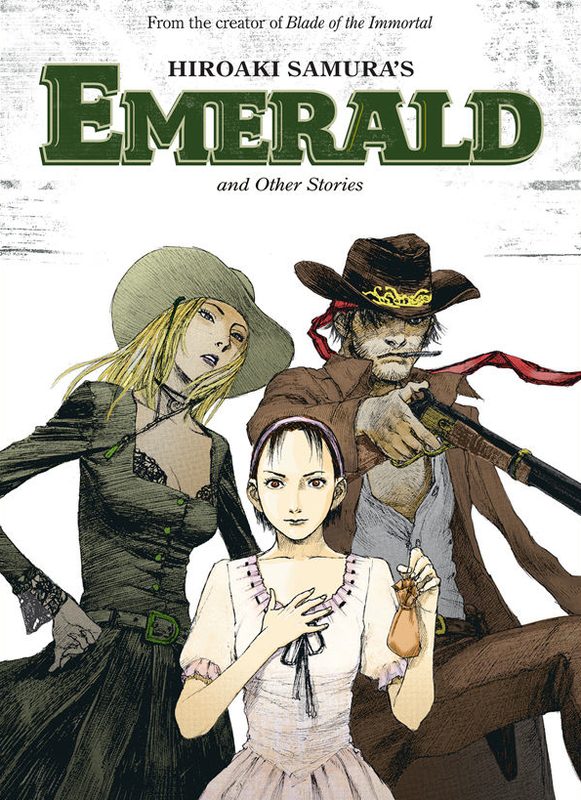 Dark Horse has chosen Emerald as the lead story and made the Wild West theme the subject of the cover illustration. This made me hesitate since it's not a genre I'm usually interested in - but only for a moment, as the artwork is too good to miss for such a superficial reason. It's a daring idea to market the book this way as manga with such a quintessentially American theme tends to be quite rare in the US; hopefully it will catch the eyes of some fans who want to try something a little different. I'm glad that I didn't let my misgivings guide me as Emerald turned out to be an entertaining read. Perhaps it's because the short story has a different feel to a normal western movie, or maybe it's just because seeing a gunslinger who vaguely resembles Blade of the Immortal's Manji alongside a beautiful Hyakurin lookalike is appealing for other reasons. I still don't think I'm ready for a full length Wild West manga - it's not tempted me to rush out and order all of Gun Blaze West or Trigun. Samura's self-contained tale, however, will stay with me for a while. Of the remaining stories, the haunting Brigitte's Dinner was my favourite. In the creator's notes about each manga, which are included at the end of the book, he reveals that Brigitte's Dinner had to be trimmed in length. It's noticeable; even with the cuts it remains a strong story, but without them it might have been amazing. The Kusein Family's Greatest Show was the other stand-out for me. It's unashamedly weird, flitting between genres several times within its brief 48 pages. It's also the most sensual manga in the book (a later story, Shizuru Cinema, starts off with some similar themes before taking a turn for the strange). The other treats contained in this book are chapters from a schoolgirl gag manga titled The Uniforms Stay On. The dumb conversations between teenaged girls have become a popular topic for gag manga lately, only here those girls are drawn more realistically than usual and the topics extend to politics and news stories as well as the usual fare. Samura plays it straight and doesn't pander by making the girls sexier or cleverer than they need to be. They're sarcastic, overconfident, vain and whimsical - and fun to watch in spite of it all. I found it odd that there's no obvious indication from the cover that this book isn't suitable for readers of all ages. Its questionable themes definitely place it in the 'mature' category and shrinkwrap isn't much of a deterrent. Overall, I enjoyed Emerald And Other Stories very much. It's not the first of Samura Hiroaki's compilations to be published in English; that honour goes to Ohikkoshi back in 2006. With darker themes replacing Ohikkoshi's exploration of young love, I feel that Emerald And Other Stories is the stronger offering of the two and wouldn't hesitate to recommend it to fans of the artist or short stories in general.